You may not know it yet but you will soon learn that I LOVE THE MASTERS. This year I got to show off the course and my love for the tournament to Scott, Mary, and Chad for Friday’s 2nd round. 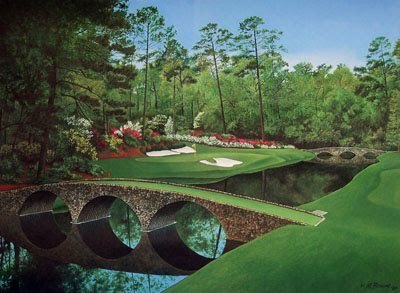 I have realized that The Masters, and Amen Corner in particular, provides the perfect metaphor for my life. Let me explain…. I’ll start at #1. Standing on the first tee. Not knowing what to expect. I am full of hope that this could be one of the greatest rounds of my life. Such a thrill to even be able to stand there. But also very scary. Knowing that this is where the greats of golf have stood. Having seen for myself the pitfalls that lie ahead. Having seen people conquer the course and and be counted among the legends of Master’s history and having seen shipwrecks take place – also taking their place in Master’s history. What will this round hold for me? 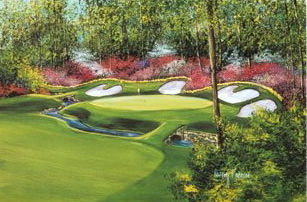 On to Amen Corner – which is the phrase coined to designate holes 11, 12, and 13 -because when you are finished playing them you breathe a prayer of relief. First, hole #11. One of the hardest holes on the course. It demands that you start well if you want to finish well. It calls for courage and finesse and creativity. This is where Larry Mize broke Greg Norman’s heart in 1987 with an improbably 140 foot chip in from off the green to win the green jacket. The thrill of victory! The agony of the defeat! It is said that The Masters does not really even begin until the back nine of Sunday’s round. You have to survive 10, 11, and 12 to get to the 13, 14, and 15. A little history. In 1980 this is where Tom Weiskopf put 5 balls in the water and made a 13 in the first round. In 1992 this is where Fred Couples made a miraculous par after his ball semi-plugged into the bank above Rae’s Creek. This is where Tom Watson double bogeyed in 1991 costing him the tournament and losing to Ian Woosnam. In 1997, Tiger Woods came to the hole with a ten-shot cushion. Despite his commanding lead, Woods couldn’t help but smile and then exhale once his tee shot found the green. This is where the pendulum swung in Tiger’s favor this year as Francesco Molinari put one in the drink and vaulted Tiger into a tie for the lead. It is a hole where you can come away with eagle. but it is just as easy to come away with double bogey. It is a startlingly beautiful hole. The hundreds of azalea bushes providing a gorgeous backdrop to the perils that lurk just one shot away. In 2010 this is where Phil Mickelson took control of the tournament with his bold 2nd shot out of the pine straw, under the trees, over the creek, onto the green. It was a ridiculously amazing shot that captured in one moment what this hole is all about. Risk and Reward! In 1985, Curtis Strange came to #13 with a 3 stroke lead, went for the green with a 4-wood, hit into Rae’s Creek and wound up making bogey on his way to a back-nine collapse. He never won The Masters. Risk and Reward! This year’s tournament was epic. Never to be forgotten. I could hear the Tiger roar way up here in North Carolina. You will watch people play 20 years from now who watched this year’s Masters and decided that golf was the game they wanted to pursue. For me, The Masters is indeed a great metaphor for life. And it reminds me why the game of golf is such a great game – but even more importantly, why God created me to live a life of purposeful adventure. And why He did the same for you. I’m looking forward to watching your adventures play out over the years and hope to be a part of many of them.